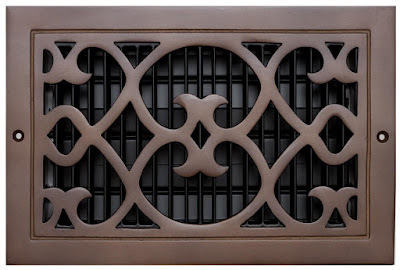 How long have we seen the same old, familiar grill covering over the air vents in our home? Is it time for a change? Of course it is time! Pick a topic! What brings romance to your thoughts? How about a reminder of the renaissance era with a special era designed air vent cover in the dining room? Pair that new air cover vent with roasted pork and some new culinary knives and you have created an atmosphere worth revisiting night after night! And it's completely do-able! DIY project that takes just minutes to accomplish! Classic Grills decorative heat and air conditioning grills, registers, return air register overs and air vent covers come in a variety of styles as well as assorted metals and finishes. Finishes include Antique Burnished Bronze, Dark Oil Rubbed Bronze Finish, a light oil Rubbed Bronze Finish and a Satin Nickel White Bronze Finish. Aluminum grills are an inexpensive alternative to bronze grills. Smaller sized aluminum grills are available for floor installation. 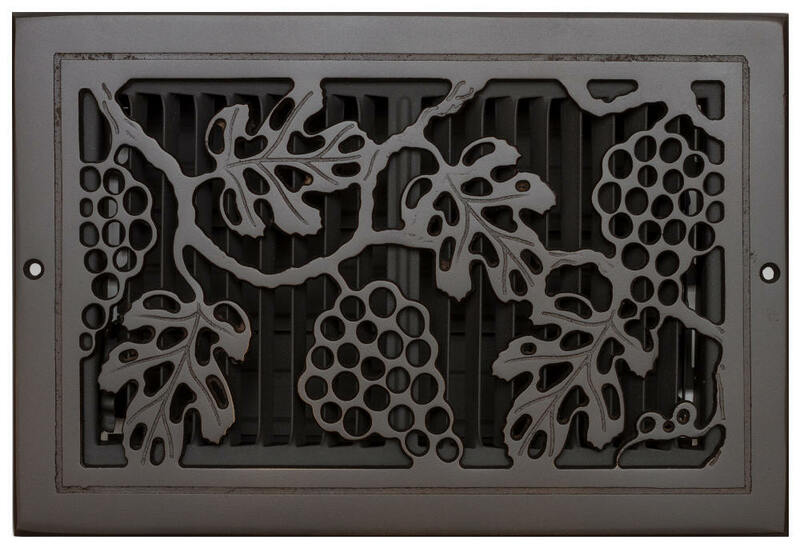 Our Classic Grapevine Design Grills, which can be used for custom air vent covers, as registers, for return air registers and more are available in twelve popular sizes. 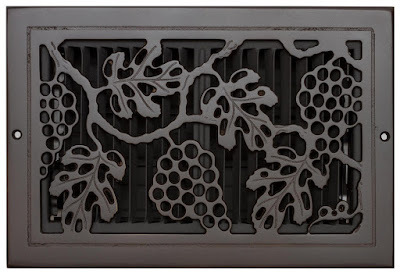 Our Custom Grape Vine Grill or Grape Leaf Grille is pictured above with an Air Supply Damper. Air Supply Dampers, also called Air Supply Louvers in an air vent cover regulate airflow. Our Air Supply Dampers (or air supply louvers) assembly for our custom designed grilles, registers and air vent covers include: a wheel lever for accuracy when regulating air flow, a recessed face-plate that allows your new grill to fit tightly against the wall, floor or ceiling. Floor register covers include a sturdy inside grille to support heavy foot traffic for floor vent covers. All of Classic Grills standard-sized air supply grills include an adjustable damper. For sizes other than our standard sizes commonly available, contact our Classic Grills Sales Team for a quote at Sales@ClassicGrills.com or call 760-213-0427.